Thin delicate petals without bulky center pods are the most successful if you want to press and dry the whole flower, otherwise you may want to process only individual petals. You can chose pansies, verbinas, larkspur, wild roses and many other appropriate varietals. These process well and retain their unique coloration. Flowers retain moisture overnight and we recommend not picking the blossoms at full moisture. You will, dependent on weather and heat, have to adjust “Picking Time” to the stage where the blossoms “unfurl” as moisture is released...and the intrinsic character of the flower is at its’ best. Pick on sunny days between 10:00 am to 2:00 pm because after 2:00 pm the flower petals begin to shrivel somewhat in the sun. Remove the blossoms carefully, place them face up on clean newsprint (very absorbent) and cover with a second sheet of newsprint and add the next sheet overtop when appropriate. You will be able to press between 30 & 50 blossoms per 11” x 14” sheet. A small “drying press” is helpful but a simple Masonite overlay board weighted to press the flowers will be appropriate. You’ll get best results if you insert felt cloth between layers to allow the moisture to escape. Drying time is between 7-10 days. You are working with a natural organic blossom that is very delicate both physically and chemically. When creating a stable keepsake card (like a wedding invitation) please use “acid free” cover paper to prevent what we call “brown-out”. “Brown-out” occurs as the blossom encounters the acidic chemical content of most paper. 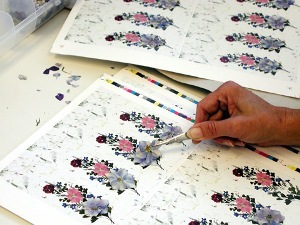 Apply with a drop of white glue on the back center of the blossom and delicately position it into your design. Many little diverse elements may be used in each design and it will be fragile so a 1.5 mil double sided lamination is recommended. This deprives the organic material of oxygen which is the cause of “brown-out” (due to oxidation). It will also preserve the intense coloration of your flowers and really create a fine piece of floral art. Now you have a beautiful handcrafted keepsake! Explore the possibilities! Study the real pressed floral designs created by Creative Graphics Gifts by checking out their products here.